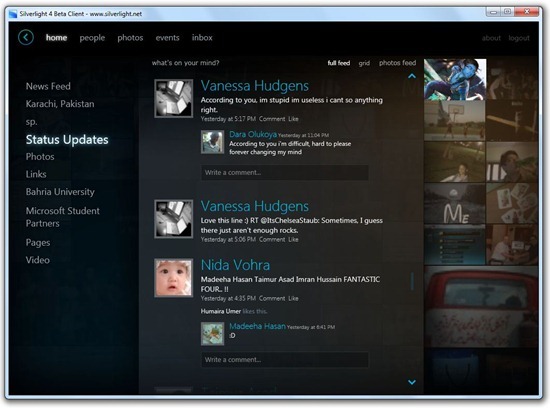 Microsoft has just released Silverlight 4 based facebook client for both Windows and Mac OS X. 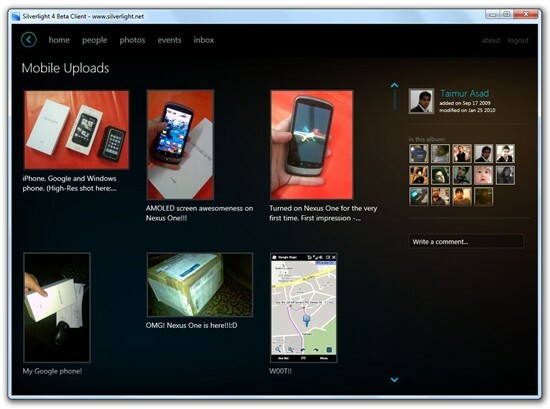 Back in April last year, Microsoft showed off a proof of concept facebook client which was made using facebook’s Open Stream API on Silverlight but unfortunately that never saw the light of the day. After a long wait, they have finally released a fully working client for users running Windows and OS X – with full capability to run it out-of-the-browser. This application brings together the many compelling platform capabilities of Silverlight 4 into a rich out-of-browser application in the familiar context of Facebook. Enjoy the photos, feeds, events, friends’ walls, and inbox mail from your Facebook account in an appealing and user-friendly environment. To try out this Silverlight 4 based facebook client, head over to the official Silverlight page to download and install Silverlight 4 Beta for your respective platform. Here is a short video, published by ithinkdifferent blog which shows the touch features of the app in action on a Windows 7 PC. Silverlight 4 Beta, Visual Studio 2010 Beta and .NET Framework 4.0 were all released back in October last year. downloaded silverlight, but don't know how to get Facebook working, very confused. @Jeremy: if you downloaded the client for Mac, it's a two step process. After you did the first install – which basically puts Silverlight on your machine, you have to go back and get the Facebook client. Hope this helps. when i install silverlight on my mac, and return to the site, there is no option for the fb client. Can someone please help!! I installed and ran the latest Silverlight beta but I don't see any way to run the Sliverlight for Facebook Client. You now have to install it. Click on the Facebook client. it should give you an option to drag the client to the Applications folder, so do that. Once it's in the Application folder, click on the Application folder and find the client. Click on the client. That should do it. Open the silverlight client that you installed, then go on the site, the download for the facebook client should start. kinda like seesmic. via IE only or can be downloaded from other browser? that is the question.